Remote by design, the home and studio of Gary Noffke do indeed take you to that “other place.” Once you have cleared the formidable driveway, you are on a rise that resonates with the echoes of the active creek below. The smell of fresh ginger in the garden, combined with the cool provided by the numerous shade trees of all varieties, almost makes you believe you are not in Georgia. This is what Noffke calls home, but it is actually more of a fortress. 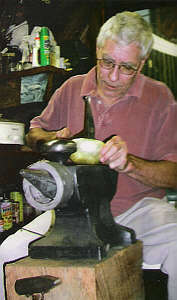 A native of Sullivan, Illinois, Noffke moved to the Athens, Georgia, area in 1971 to take a faculty position in the metals department at the University of Georgia. 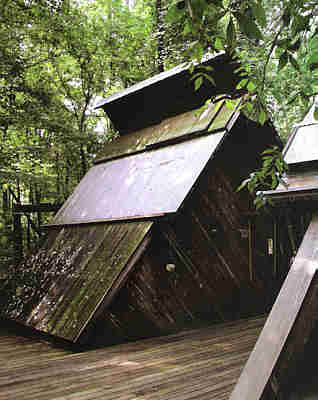 The house and studio were constructed in 1973 and based on designs by architect James Mitchell. Construction was executed by Noffke and a host of friends, and took approximately one year. The wood cantilevered A frame, with its large and peaceful deck overlooking the water, has stood the test of time, although Noffke has invented the new and dangerous sport of swatting wood eating bees with a tennis racket. The house and the studio are physically connected, just as the work of Gary Noffke is connected to the very essence of his life. Noffke’s professional achievements are numerous, with work in major museum collections. He remains the metalsmith’s metalsmith. However, he also remains the predominate collector of his pieces, a loss for the world of contemporary metalsmithing, What makes Noffke’s work so crucial to this field? One of the many answers would be his innovation with alloys. 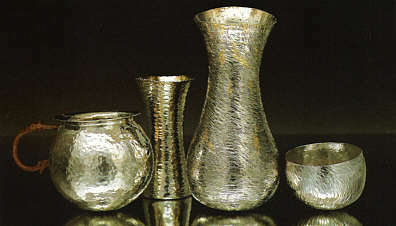 Never satisfied with the properties of sterling silver, Noffke was awarded a faculty research grant in the early 1970s from the University of Georgia to explore cold forging fine silver from sheet. During that period, he did a lot of hot forging with copper for student demonstrations, and began to think more intensely about silver. Surely if copper could be hot forged so readily, silver should have the same potential. In 1983, Noffke began experimenting with hot forging of sterling, but the short heat range of sterling again proved unsatisfactory, so the next year he began hot forging fine silver and producing spoons and small vessels. Finally in the early 1990s, it hit him, what if he made his own alloy that would be more suitable for hot forging? By eliminating some of the copper content in the sterling silver he began to cast his own billets of 969 silver and the rest is history. The new alloy provided him with the perfect metal to achieve the hollowware forms of the scale he had long sought. His current focus is now hot forging gold and he is one of the very few people in the United States, if not the world, hot forging gold from cast billets. It is important to note that this innovation occurred while Noffke was devoting his academic career to developing the metals program at the University of Georgia and producing an outstanding group of students who have remained active in the field. He is always eager to share his knowledge of metals, as evident by his extensive record of visiting artist invitations at both universities and craft schools. Noffke’s studio is a comfortable space for one and outfitted with the tools he needs. His Peddinghaus anvil, replete with a roll of duct tape to muffle the sounds of hammering, two stumps for his rounded stakes, a tumbler, pickling bath, a desk for finishing, and a highly decorated antique refrigerator, suit his needs and have allowed him to produce an amazingly large body of work. Besides being an internationally known metalsmith, Noffke is also an amateur mycologist, an avid hunter, fisherman, organic gardener, and excellent cook. While never give up his secret morel hunting spot or his favorite deer hunting locations. He will exhaust all resources to help those close to him and the thing that motivates him the most is making work for the people he cares about. This also includes the needs of his pets. His dog Sister enjoys water from an elegantly forged silver bowl, while Ruby the cat, enjoys a gold bowl. His series of gold birthday cups for his daughter Sydney stand apart as some of his finest pieces to date, and are physical manifestations of his great love for her. Legends about Noffke are numerous he has a reputation for being cantankerous. The dating and occasional misdating of his work is evidence of this attitude. “I always felt like the art historians had little interest or knowledge of contemporary metalsmithing and all they had were the dates, and I am taking that away from them.” Sometimes he claims he is not sure of the correct dates, but that could be an exacted ploy and a part of his trickster personality. Noffke continues to pursue his love of hot forging nonferrous metals in many different venues. He has executed several private commissions since his retirement from the University of Georgia in 2001, and is currently exploring other ways to expose his work to a larger audience through public commissions. Ultimately, Gary Noffke is the real deal. An artist on all levels, his command of the craft has changed not only his work, but the field of metalsmithing.